Turkmenistan became an independent nation on 27 October 1991, and in February the following year proudly adopted a new flag. It has been slightly tweaked since then, the major change being the addition of the two olive branches at the base of the vertical stripe. This was made after the United Nations accepted Turkmenistan's status of permanent neutrality in 1995. 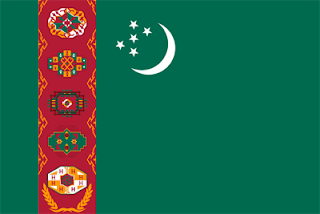 Green and red have long been venerated by the Turkmen. The vertical red stripe contains five basic carpet gul. A gul is a medallion-like design element typical of traditional hand-woven Turkmen carpets. These guls represent the five houses or tribes of Turkmenistan, which, from top to bottom are Teke, Yomut, Arsary, Chowdur, and Saryk. The crescent signifies the hopes of Turkmens for a bright future, while the five pointed white stars represent the country's five velayat, or regions: Ahal, Balkan, Dashhowuz, Lebap and Mary. It is interesting to compare the new flag with the former Turkmen SSR flag, adopted in 1952. 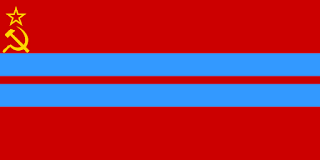 Like the other Central Asian Soviet Republics, the background is red and the hammer and sickle represent the peasants' and workers' union, and the red star is the symbol of the proletariat. It has been suggested that the blue lines represented the Amu Darya (Oxus) river that runs along the northeastern border of Turkmenistan. The other blue stripe may stand for the river Atrek, which forms the border between Turkmenistan and Iran, or the Caspian Sea, the western border of Turkmenistan.